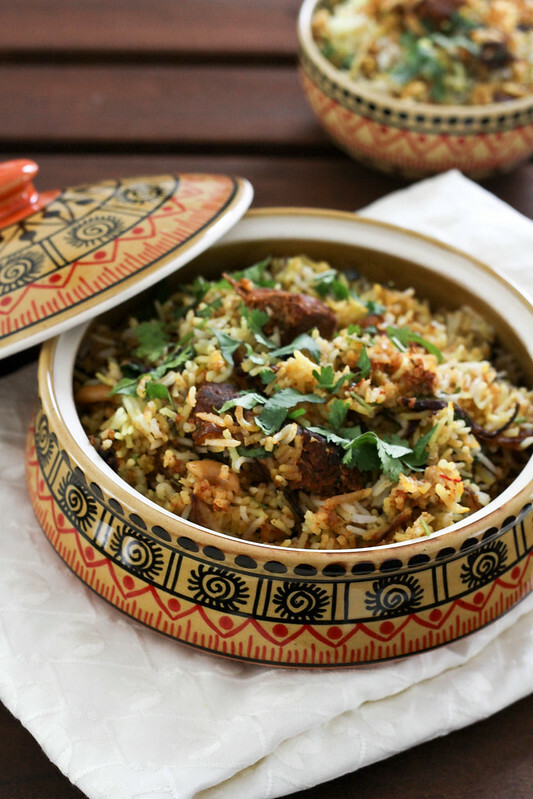 Biryani is one of the favorite dish in our family. 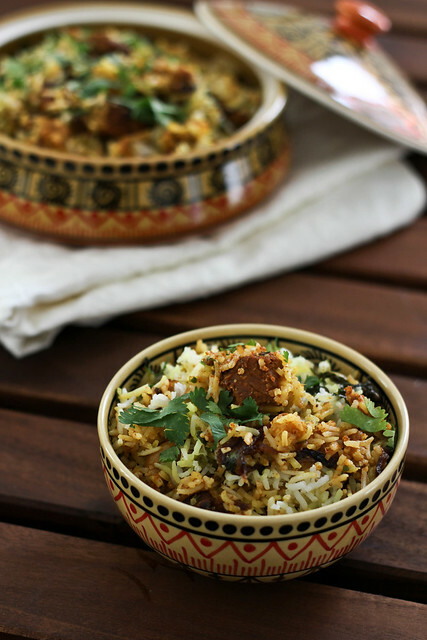 J is so crazy about it that when ever we plan to visit India, he asks my dad that by the time we reaches home there should be a packet of Paradise Biryani ready for him at home. Paradise is the famous Biryani house in Hyderabad. 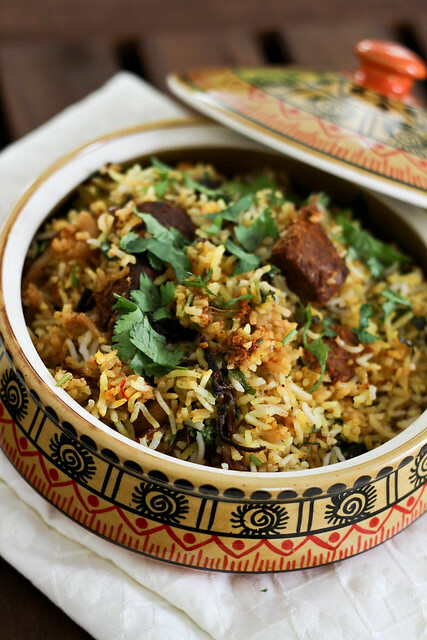 They say that visit to Hyderabad is incomplete without a visit to Paradise and tasting the Biryani there. This restaurant was started back in 1953 as a small cafe and slowly developed into a famous restaurant. So coming to the recipe, this was one of the first dishes I learnt and is loved by everyone at home. It looks like a very long process with a long list of ingredients. But it is very simple to make, if you just follow the steps. Mix all the ingredients well, and let it marinate for 2 to 3 hrs or overnight if possible. Put the marinated meat at the bottom. 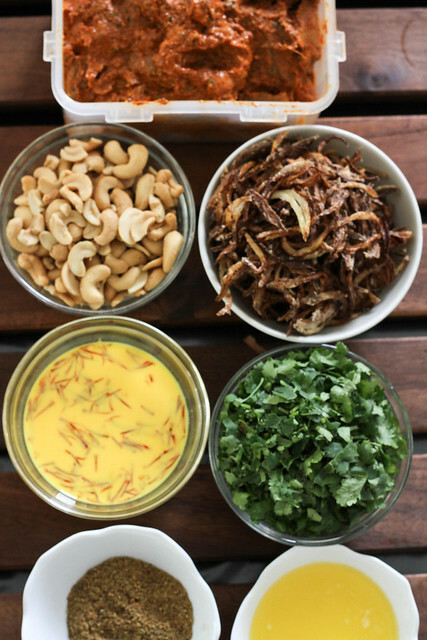 Sprinkle some chopped coriander and mint leaves, fried onions and cashews. Layer half of the rice on the meat. Now pour half of the ghee evenly on the rice. Next pour half of the saffron milk evenly all over. Sprinkle 1 Tbsp of masala powder. 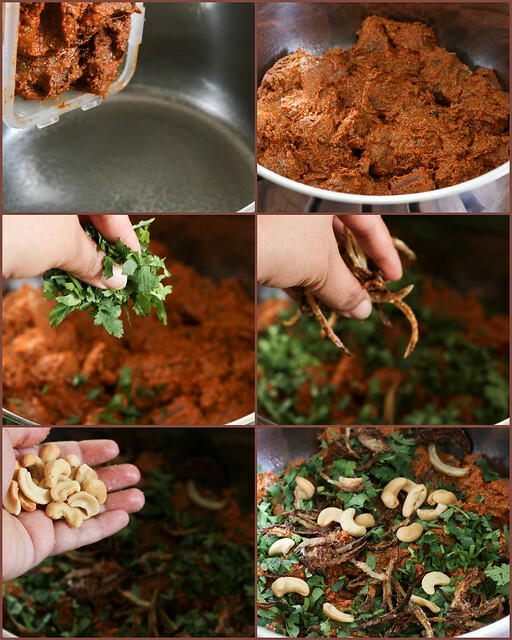 Spread half of cashew nuts, half of fried onions and half of coriander and mint leaves. 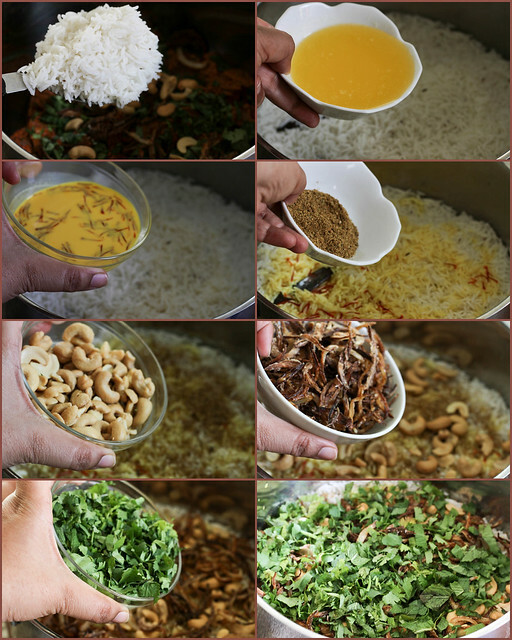 On this, layer remaining half of the rice, and repeat the same steps – adding remaining ghee, saffron milk, masala powder, cashews, fried onions and coriander and mint leaves. Turn the heat to medium low and cook for 45 mins. you have explained in such a way that even a person who doesn’t know how to make an omlet can easily cook and serve amazing biryani! Congrats. I love biriyani and my daighter too, but hubby is not a huge fan he would eat , but he is like why cant you give the curry and the rice seperate. Wow! spandana, this looks soooo yum!!! I wish I could dig a spoon in a savour a mouthful…photos are delectable.. I shared a biryani recipe too, but it’s chicken 🙂 I love the props you used.. so colorful and unique! Now this is a beautiful layout! Well done! As previously said… you do it in a way that makes us feel we could all make it tonight. yum! I totally agree with you visit to paradise is not complete when you visit hyd…..Husband is a huge fan of biryani and almost every sunday i make it. Your version is little different to how i make…this sunday will take your recipe.